Pisang Goreng literally translated means fried bananas. 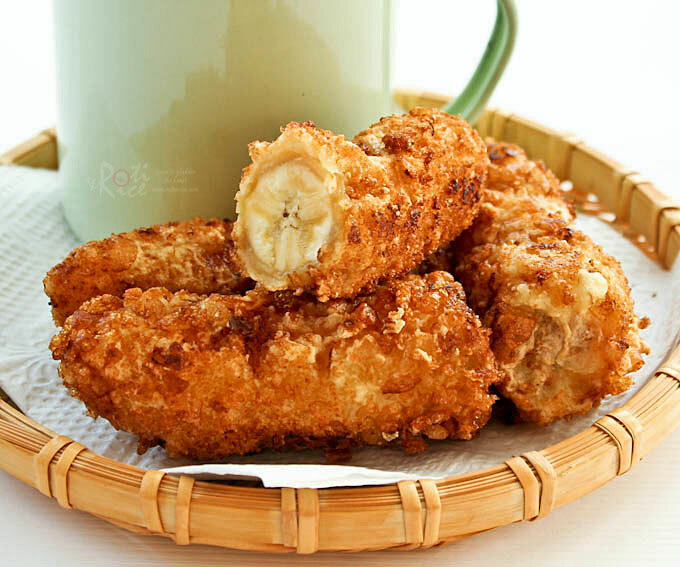 These battered and deep fried bananas are very popular in Malaysia and Singapore. Sold by street vendors, they make great tea time snacks. They are best eaten straight out of the pan while the fried batter is hot and crunchy and the banana is sweet and warm. Getting the batter right is key to this dish. It should have a light and crispy texture after being deep fried. To achieve this, I use rice flour for the batter and crushed rice cereals for the coating. Once coated, the bananas should be dropped gently into hot oil and fried for just a couple of minutes. For best results, use sweet and ripe but firm bananas. Bananas that are overly ripe will be too soft and soggy after frying. This recipe is suitable for those on a gluten free diet as the batter is made using rice flour and rice cereals. Mix all batter ingredients in a large bowl until a thick and smooth batter forms. Place crushed rice cereals on a plate. In a medium sized sauce pan, heat about 1 inch deep oil. Dip banana into batter. Remove, and roll onto crushed rice cereals until evenly coated. Lower gently into hot oil. Fry until golden brown, turning once. It will only take 1 to 2 minutes. 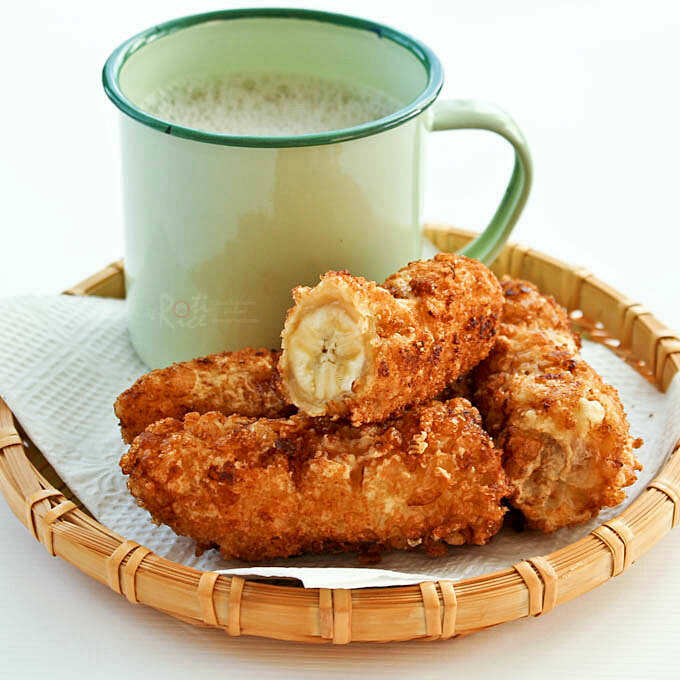 Serve Pisang Goreng (Banana Fritters) with a warm mug of Teh Tarik (pulled tea), a condensed milk sweetened black tea. This tea is pulled or poured from one mug to another to give it a foamy top. The pulling also improves the taste of the tea. For the preparation of this tea, please check out my post Vadai and Teh Tarik. Oh, what a great afternoon snack. It’s afternoon, so I would this to snack! Biren! I think we eat so much alike. I just made my list of things I want to post soon. One of them is my ‘banana fritters’. Mine are different than yours (phew;). However, yours look so awesome! I love the way the whole banana is fried crispy rice. Yum! Snack? Why snack?I can eat this at lunch and dinner. All 6 bananas at one meal! Amazing dish. Thanks for sharing. Biren, I’m all over these fried bananas – love em! Actually, I’m all over almost anything deep fried (blush). Using rice cereal adds the perfect crunch, such a great choice. My kiddies would love these. I’ll bet they’d go well with some ice cream too, but shhh…don’t tell my kiddies ;-). Most fried foods are really tasty. I think it is okay to indulge once in a while. It was a treat for me as I have not had these in a while. Yes, the rice cereals gave the fritters a nice crunch. I fried a new batch for my boys when they got home from school and they really enjoyed them. I normally just eat it on its own but I think they will definitely go well with vanilla ice cream. Love Goreng Pisang! In Asia, they use smaller (sweeter, red-fleshed) bananas for Goreng Pisang. Can you find those bananas over there? I have seen the small red bananas once at the store but I don’t think they have the ones you are referring to. We basically only find two types of bananas here – regular or organic. I love those small enamel mugs. They are great for teh tarik and coffee. Pretty hard to find these days. is nicely browned and im sure is super crispy with the rice cereal coated on it (: yummy! Oh Biren, this is one of my favorite too! I used to buy Pisang Goreng at one of the popular at the hawker center. But yours looks definitely healthier using rice cereals. Mmm…very delicious. Thumbs UP!! What a fragrant recipe! Too bad I don’t eat bananas but I’m sure I can substitute it with other fruits. I love fried food! Wow, these must be so deliciously crunchy with the rice cereals in the batter! I try to avoid this delicious goreng pisang because of the high oil content but as you said eating in moderation is fine! Great idea to use rice cereal for the extra crunch! I haven’t had a banana fritter in a long time, so I am looking forward to trying this recipe. I love that you used rice flour to make them crispy. Goreng pisang used to be such a favourite back home until I found out how bad the oil is. So home made is definitely better! My daughter has been bugging me to make ‘goreng pisang’ for several weeks now! I have never included rice crispies in the batter, sounds really interesting, an added crunch! I love your take on pisang goreng. I eat a lot of the stuff when I”m in Malaysia. It probably is the lure of buying from the street vendors that gets to me. Plantain is not always available in the supermarkets here in London so it is nice to know that it can be done with eating bananas. My children will surely love this, especially the cereal crumbs. I opened up your blog this morning, saw these delicious treats, and immediately said YUM out loud. These looks so good Biren. I only wish I had one to go with my cup of tea right this minute. Definitely a must try. 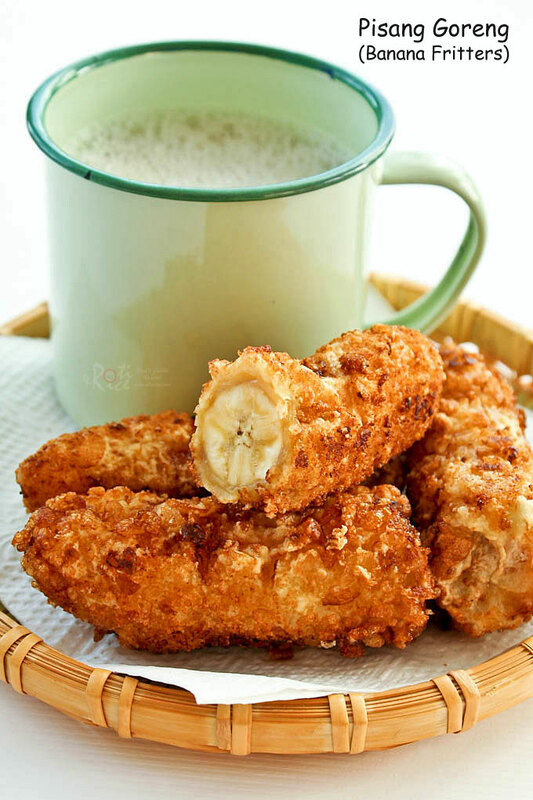 I love goreng pisang….just did not think to use ordinary bananas! I will try using rice flour and rice cereal to give it the crunch! Yum yum yum, that’s all I can say when I opened up your blog at lunch time. Another one of my favourite snacks, which is equally shared by my children. Funny how kids don’t like ripe or slightly skin-blemished bananas but would eat tons of goreng pisang made from ripe bananas. I do like your take on the cereal crumbs – that will make the goreng pisang disappeared even faster!!! And that enamel mug just brought back childhood memories of drinking my hot milo in the morning…. Good way to use up those ripe bananas. I ended up making more than 6 as the hubby and boys loved it. They were eating it while I was frying but no problems as it only takes a couple of minutes. I love those enamel mugs. Finally managed to pull my teh tarik with them. I did it over the sink. It was fun. 🙂 Have not had milo in ages. Will have to get some soon. Dudette would go crazy over these. Who am I kidding. I would too. 🙂 They look delicious. This is a snack or dessert I would definitely enjoy. I love the rice crispies on the crust, definitely a nice added texture. Wow…these look amazing! I bet they are the perfect sweet treat…yum! You’ve read my mind! I was just thinking of looking for a recipe for these, now here they are. They look amazing, can’t wait to try them. Your recipe is great and reliable. I just tried it out 24 hrs ago. I don’t have rice cereal in the kitchen. I simple replaced it with oatmeal and Nestum cereal. Plus I added a 1/2 teaspoon of baking soda into the batter to make it fluffier. Anyway thanks for sharing this wonderful recipe. 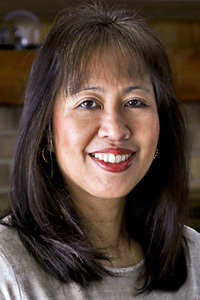 Hi Lisa! Thank you so much for coming back and letting me know. I am glad you enjoyed the recipe. Using oatmeal and Nestum is a great idea to give it a crunchy topping. Nestum is something I have not heard of in a long time. Reminds me of childhood. 🙂 I used rice cereals just to keep it gluten-free. I have not deep fried anything in my life, but so far baking and broiling worked out pretty well as a substitute. I think I’ll try the same with this recipe. It must be delicious with ice cream!